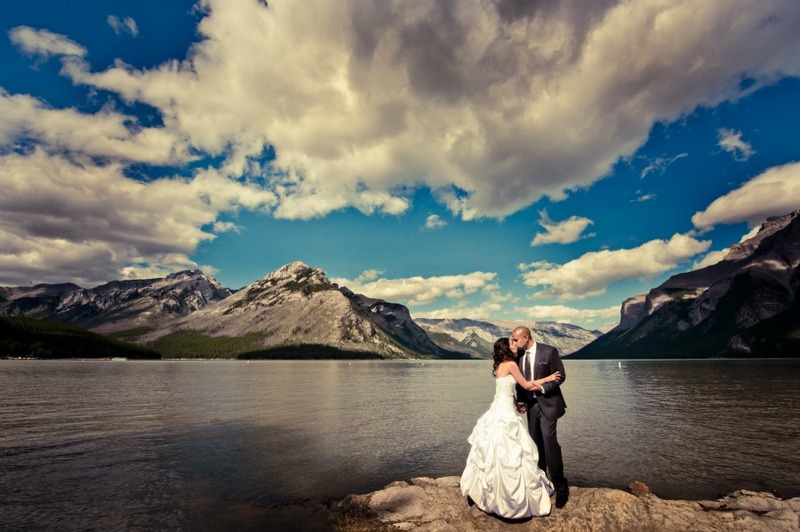 Are you planning a Canadian Rocky Mountain Destination wedding in the areas of Banff, Canmore, Lake Louise or Jasper? We’re sharing our daily tips to help get you started. It is recommended that the number of participants/guests attending the ceremony be limited to a maximum of 20 people. Vehicular traffic should be kept to a minimum (use car pooling or group transportation). Wedding participants are required to comply with National Park Regulations at all times. All participants and wedding guests must possess a valid National Park Pass. Participants must not disturb the park’s natural and cultural resources (ie: no picking or disturbance of flower beds, setting up of chairs or removal of trees or branches). Items such as confetti or rice is not permitted and a thorough clean up of the site is required immediately after the event. 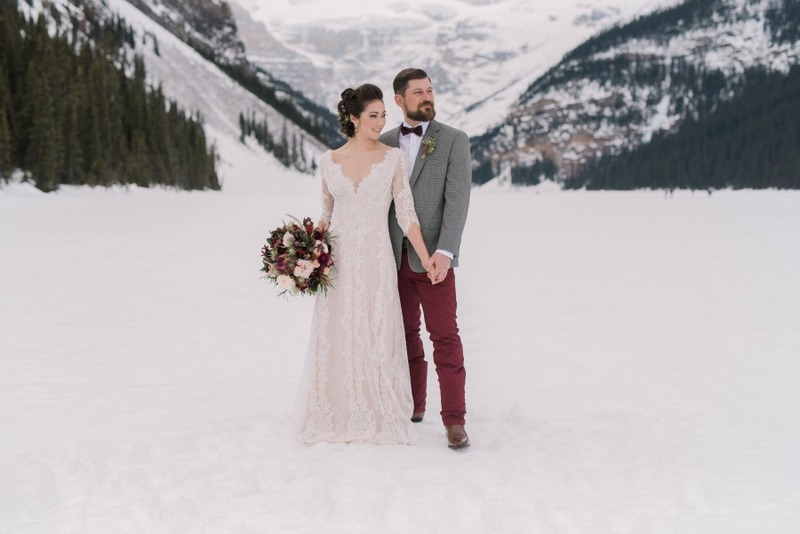 Read more here, for a complete list of requirements for an outdoor wedding ceremony in Banff National Park or talk to your local wedding planner for more information. 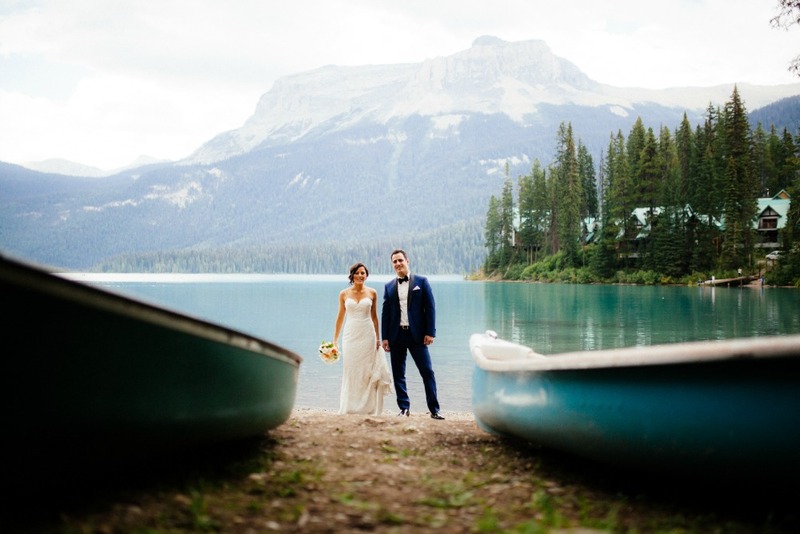 Click here to read Tip #2 – 30 Tips for a Canadian Rocky Mountain Destination Wedding in Banff, Canmore, Lake Louise and Jasper. Contact Naturally Chic for help with planning your Canadian Rocky Mountain Destination Wedding at 1.888.679.9056 or hello@naturallychic.ca. The mountains are a popular wedding destination for good reason; stunning panoramic views, wildlife, tourist attractions, an abundance of outdoor activities, world-class golfing, spas and hotels. 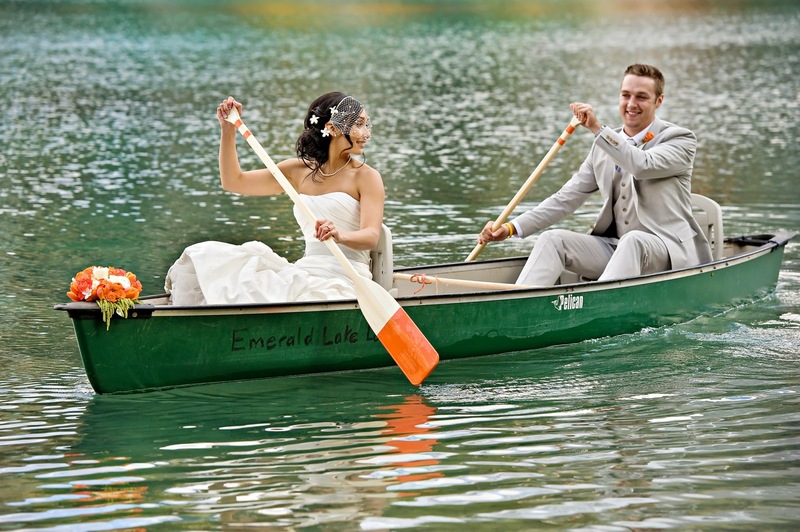 Every day we are posting helpful tips for planning your Canadian Rocky Mountain Destination wedding in Banff, Canmore, Lake Louise and Jasper. Planning a wedding can be a daunting experience, but it’s even more complicated planning a destination wedding away from home. We’ve compiled 30 helpful tips to assist you in planning your mountain wedding. Be sure to check back daily! Start your wedding planning early. If you can, plan to book your venue at least one year in advance. The mountains are a popular tourist destination especially in the summer and venues book up fast. If you’ve been dreaming of a wedding at the Banff Springs Hotel your entire adult life, you’ll be really disappointed if you wait too long and find your wedding date is already booked solid! Remember what happened to Liv (Kate Hudson) and Emma (Anne Hathaway) in Bride Wars and their dreams of having a spring wedding at the Plaza Hotel in New York? I’m not saying that will happen to you, but why take chances? Planning ahead may also ensure you get the best rates at condos and hotels. While you’re at it you should also book your photographer, wedding planner, marriage commissioner and dj well in advance if you can. Most weddings are on the weekend and popular vendors fill their available wedding dates quickly. Don’t be disappointed, plan early! Be sure to check back tomorrow for Tip #2 for Planning a Canadian Rocky Mountain Destination Wedding in Banff, Canmore, Lake Louise and Jasper. Feel free to contact Naturally Chic if you have questions regarding your mountain wedding! Our wedding booth at Bridal Expo in Calgary, Alberta was a bit of a departure from some of the more natural, earthy rocky mountain weddings we are known for. We chose a “Carnival Themed” wedding as inspiration for our booth. Carnival weddings are extremely popular and we’ve been seeing them popping up on lots of great blogs lately! But we didn’t just choose the carnival theme because it’s popular right now. 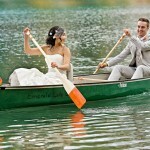 We wanted to show that eco-friendly can be fun and look different than our rustic weddings. Using vintage pieces is one way to incorporate “green” into your event. We salvaged lots of vintage pieces from garage sales and flea markets for our booth. We were lucky to find some vintage frames, milk glass vases, crystal candy dishes and silver trays. We also used vintage silverware for our table setting. With a little leg-work anyone can find great vintage pieces to repurpose. We knew we wanted a carnival theme for our booth and we wanted it to have a vintage feel. The carnival theme could easily work in many colors, but we chose shades of pink, white and a little grey for our booth. We asked friend and Calgary-based graphic designer Vishu Mahajan to design an invitation and reply card to reflect the theme. We gave her our color scheme and mentioned that we would love a ferris wheel or carousel motif…we absolutely love what she came up with! Wouldn’t this be a fabulous invitation to give your guests? It sets the tone for a fun and memorable event! My favorite piece designed by Vishu is the Welcome to “Kate and Mark’s Carnival” wedding sign which we put in a painted, vintage looking frame. I absolutely love the Carousel Horse! A view of our booth with our “ticket booth” in the foreground. Our Naturally Chic Designs team built this wooden ticket booth. It is perfect to collect any type of tickets…think carnival “ride” tickets, drink tickets, etc. Maybe even a “kissing booth”?? Instead of using traditional numbers for table numbers, we thought it would be fun to have the tables named after various rides and fair elements: ferris wheel, carousel, roller coaster etc. Here’s the Ferris Wheel table (also designed by Vishu Mahajan); we love it in our vintage looking table number holder. Stay tuned for more of our carnival themed wedding booth. Thanks for visiting! To contact Naturally Chic for assistance with your wedding planning and design call 1.888.679.9056 or email us at hello@naturallychic.ca .